Donington is a fast, flowing and immensely challenging high speed circuit , not particularly well suited to HRDC cars, which helps to make the spectacle particularly exciting. The format of 'Touring Greats' and 'GTS65' - have been elevated to 1-hour race duration. These mini-enduros are joined for the first time by HRDC 'TC65', which should see the return of the mighty 'big banger' Galaxies, Mustangs and Falcons and the feisty 'Homologation Specials' such as the Lotus Cortinas, GTAs, 1800 Beemers and Cooper 'S' Minis, all of which will undoubtedly be sliding, slithering and slugging it out down Donington's buttock-clenching Cramer Curves in fine style! 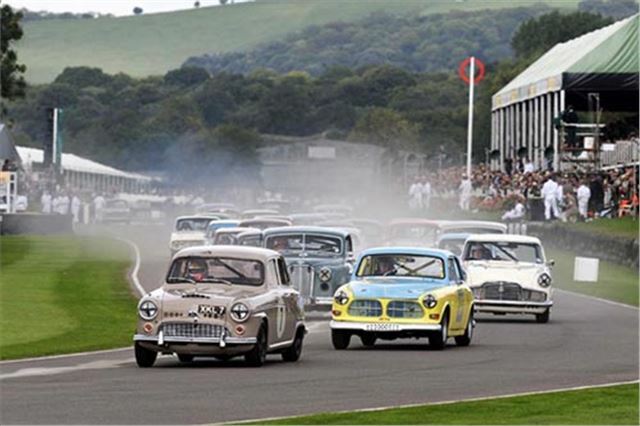 HRDC's regular 30-minute race format remains for 'Grand Touring Greats', 'MGB50' - which will again include classes for selected historic MGs - and finally 'TC63' - the series for early-1960s touring cars. Altogether, these HRDC races form a high-quality, action-packed programme, which can be judged by the best of standards! This meeting will be run for us by the BRSCC and its good friends, BRSCC Competitions Director Drew Furlong and our BRSCC/HRDC Permanent Series Steward Barry Ashman, will be there to see that all runs smoothly on this action-packed day of high-quality historic racing! So please support this meeting. It is the pinnacle of the HRDC season and has a lot riding on it for the future of the HRDC - not least our ongoing relationship with Donington, whose team will be keeping a close eye on the quality of all our grids and the standards of racing. I am hopeful that we can forge an ongoing partnership, whereby the HRDC and Donington work together on greater projects which will benefit all of us who wish to race at the very highest level of historic motorsport. RACE ENTRY FORMS AND SPECTATOR DETAILS CAN BE DOWNLOADED FROM www.hrdc.eu .